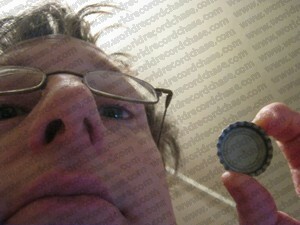 This is the story behind my Guinness World Record™ for the Most bottle caps moved with the mouth in 30 seconds. I’ve had to get my teeth repaired after doing such things as lifting and moving objects which are resting on hard surfaces. Because I remember that, I was having difficulty becoming inspired about trying to move more than 40 metal bottle caps off a solid table top as fast as possible. That was until I had a brain wave: improvise! Innovation is a good thing, even where it is used to dream up new ways of doing the most ridiculous things such as speedy cap-moving. In fact, I don’t care what the world’s most serious innovators think of me because I like what I do. If I cared what everyone else thought of me, I’d not get much done, I know. On my way to visit an elderly friend, I spotted a tradesman installing a new appliance on a house. He was tossing aside the boxes he’d brought the parts in. Well, well, well. As they say, one man’s trash is another man’s delight. And in this case, that was true. The tradesman was probably going to throw those boxes in a huge rubbish dump and do the environment no favours in the process, but if I could get one box, I’d use it and then recycle it! I matted down my hair which I hadn’t combed well before leaving home, so the tradesman would think I was a successful businessman. With my chest puffed out, I pointed to the box I wanted, and, as I expected, the man gave it to me. Great stuff. This box was large, and I didn’t have a table that was big enough to support it. But I had a sofa, cushions, honey, towels, a drawer, a pet food container and bedding. At first, I couldn’t work out how to get the box into the right position as the world record rules required – at exactly the same height as the caps to be moved. But 6 jars of honey saved me. I placed a drawer full of bedding on the carpet, using the bedding covers to cradle the cushions stacked on top of it. But that arrangement was unstable, so I had to show the judges that my purpose-built ‘table’ was level. That’s where the cat’s empty food container came in handy. I part-filled it with water and laid the transparent vessel on the top cushion, and waited until the water had stopped moving. I levelled my eye with the water surface and as I wanted, I had proof that my make-shift surface was indeed flat. Next I laid the box the required 30cm away on the sofa, but it was lower than the top of the upper cushion. What could I use to prop up the sofa? Honey pots, of course. Turning 6 of the full containers upside-down, I raised the couch onto these temporary ‘feet’ and angled it as needed. If somebody had come to visit me right then, they’d have been convinced I am insane, I bet. But nobody arrived, thank goodness. Now that the box and the surface on which I’d lay out the caps were both at equal height, I got to work. Into the box I placed towels, which I suspected might help with the cap count. And then for the bottle caps. I laid out row upon row of caps, each not touching and within easy reach of my lips. I was confident I’d not smack a tooth out this time, so I was prepared to pick up each cap with lightning speed and send it flying into the box. My first attempt was a failure. So was the second, the third and many more. I took a break and went outside to stretch and flex my body on the grass. The neighbours know I’ve lost my mind, so why would they care that I was then throwing my arms and legs in all possible directions as my way of exercising on the spot? I craned my neck forwards, to the left and right, and revolved it on my shoulders again and again. If I could loosen my neck muscles, I thought I’d become somewhat more rubbery… a good thing for moving caps with my mouth. When I returned to the setup in my office, my neck was wobbling on my shoulders and it felt really good. All I then needed to do was utilise that energy for transferring those metal caps in front of me. I kneeled and set the timer: 3, 2, 1, fail. I was failing. Then I had a thought which made me feel instantly better. During tin mining, to make some kinds of bottle caps, I bet the miners don’t succeed first time, every time. Like them I knew I needed to try repeatedly, and I would succeed in the end. There would be a difference though… mining companies often ruin the beautiful places they work in, but I would clean up so well after myself, nobody visiting me would ever know I’d done this. It was time to try again. With the caps all neatly rearranged, I retried. When the timer hit the start time, I launched in, gripping each cap carefully in my lips before flicking it as fast as I possibly could into the box and then redirecting my neck to the rows of waiting caps. And I moved 42 – awesome! The dizziness hit me once more and for a brief moment, I stood there, waiting for the blood inside me to settle. What a relief… I now stood a chance of becoming the latest world champion for moving bottle caps with my mouth in 30 seconds. I submitted my evidence, and waited nervously. Then, as I’d hoped would happen, the official decision was announced: I had succeeded at yet another world record. Incredible! I clapped and did a little dance at the end of my office table when I found out. Isn’t life so wonderful when one’s meaningful achievements are recognised?